The mattresses of the line Technogel Sleeping redefine the concept of rest , which is the basis of our physical and mental wellbeing . They are the result of years of research, continuous innovation and passion for design. The heart of these products is a material that is both solid and liquid: it is able to combine the three-dimensional deformation of a fluid with the memory of a solid material. It’s a perfect combination that allows this material to adapt to the movements of the body like a second skin . It’s a polyurethane-based substance completely non-toxic (it is made without the use of oils or plasticizers) , developed at the beginning in the medical field and now use in a wide range of applications , thanks to the added value in terms of comfortable . 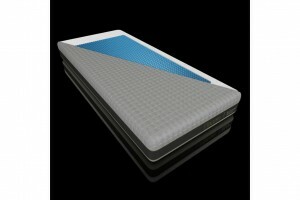 The Technogel mattress is capable of supporting each part of the body in a balanced manner favoring an excellent ergonomic support , due to its ability to adapt in the three spatial dimensions. Technogel is modeled according to the physical structure of each individual. The pressure is evenly distributed over the entire contact surface favoring a sensible reduction of pressure peaks , and an improvement of the blood circulation. To have more informations about the Technogel’s product read our article about these. Are you interested in Technogel?